Cage, South California's unsung heroes of classic heavy metal, return with their sixth studio album Supremacy of Steel: expect your ears to melt, and then your eyes. Combining the passion of traditional metal with speed and thrash metal, within a melodic wrapper, singer-screamer Sean Peck and company, deliver a relentless and intense package of American 'true' metal. The operative word here is 'metal,' from the album art by Marc Sasso (find a high resolution image on the web and enjoy the detail) to the lyrical themes to the blistering pace and stinging guitars. 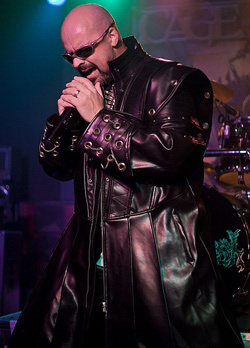 Above, Cage vocalist Sean Peck: In fine heavy metal leather, channels the spirit of Sir Halford. For the traditional themes of heavy metal, Peck hits the high points: zombies (War of the Undead), war and war machines (Flying Fortress, The Monitor), the horrific and morbid (The Beast of Bray Road, Skinned Alive), sword and sorcery fantasy (King of the Wasteland), and evil comic villain (Doctor Doom). As usual with his storytelling, Peck is clever and entertaining. Much could be said for Cage's heavy metal. The bulk of the tunes are massive slabs of ferocious intensity that don't give the listener moment for pause or breath. Certainly, Cage can mix tempos here and there, with the best examples of variation in King of the Wasteland and Metal Empire (an ode to you know what). But, mostly, the tenor and pace of this album is simply open throttle and bombastic. Of note: the addition of Steve Brogden on guitar has given the fret work a better and lasting impact than 2009's Science of Annihilation. Essentially, Supremacy of Steel is simply Cage being Cage, and offering another record of blistering and ear-shattering metal. 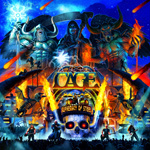 Call it expected consistency or redundancy, strength or weakness, there is no denying Cage's powerful American heavy metal. They have never been more lucid and intense. Up the irons! Cage's Supremacy of Steel offers, once more, blistering and intense American 'true' metal to melt your ears and blow your speakers.